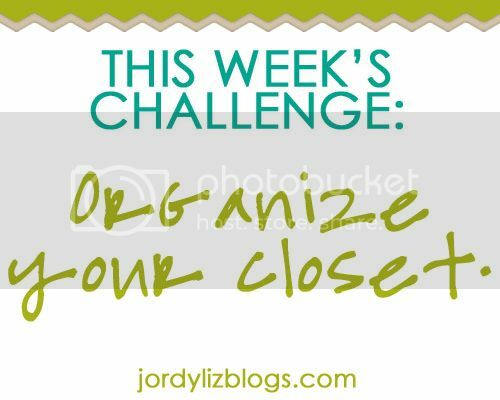 Jordy Liz Blogs: Organizing Life: Week nine challenge - last week! Organizing Life: Week nine challenge - last week! Let's get going on week nine - the last week! You'll have a week to complete this next challenge and you can come back on Tuesday, July 31 to link up. I know when people read this they begin to dread everything about the words organize and closet. But to start the school year or Fall and kick off the end of summer with a clean closet? Major plus. Why do you still have that shirt you never, ever wear? Donate it! Why are your shoes in a pile on the floor? Find a spot or basket for them! What is all of that stuff crammed up at the top of your closet? Go through it! The timing on this challenge is perfect since I'm supposed to clear out our newly constructed bedroom/office closet so my husband can tile the floor this weekend! Hope it worked out for you!